Child gun safety should be a no-brainer for most people. Guns are not toys, and as such, should be kept away from children. 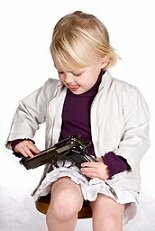 Firearm related accidents are a leading cause of injury or death in children. Nearly half of all households in the United States own a gun. People have stored guns under a bed or mattress, or in a cardboard box on the top shelf of a closet. If a gun is not properly stored, the odds are in favor of a child finding it. Many gunshot injuries occur after children discover loaded guns at home. Realize too, that although you may not have a gun in your own home, the children in your care may be exposed to guns in their own homes, or the homes of friends or relatives. As far as in-home daycare is concerned, ANY AND ALL firearms must be inaccessible to children and kept unloaded. Both the firearm and the ammunition must be stored in separate locked containers. Statistics alone should help on this one... it's hard to believe how many children are injured at home every year due to firearms. Lock them up! Same goes for any BB guns or paintball guns. There should be NO access. Store the keys for the guns and ammunition in a separate place than you have your regular household keys. Lock up all gun cleaning supplies also. They are poisonous. Make sure you find out the laws in your state on this one. While most states generally permit you to have firearms or ammunition in a daycare home as long as they are locked up, a few states ban firearms completely in home daycare's. The National Rifle Association puts out safety information for kids in the form of the "Eddie Eagle Gun Safety Program". 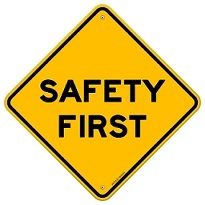 This program promotes safety for preschoolers through third grade. It is taught in four steps. The four steps are, Stop, Don't Touch, Leave the Area, and Tell an Adult. This is a program that can easily be taught by daycare providers.They have activity workbooks and a video for this program that are kept at a very low cost.This is a well put together program that I DO recommend. The program itself does NOT promote gun ownership at all. Another good program is Project Child Safe, a program that gives out free gun locks at special fairs. Check also with your local police department that probably has a free gun lock or trigger lock program. Take child gun safety seriously. You may be saving a life in the process.